Last Friday, my 18 year-old nephew and I flew out of Mitchell Field in MKE headed for Sky Harbor in PHX. I decided about a month ago to take him on a trip to visit his one year-old cousin, my other nephew. 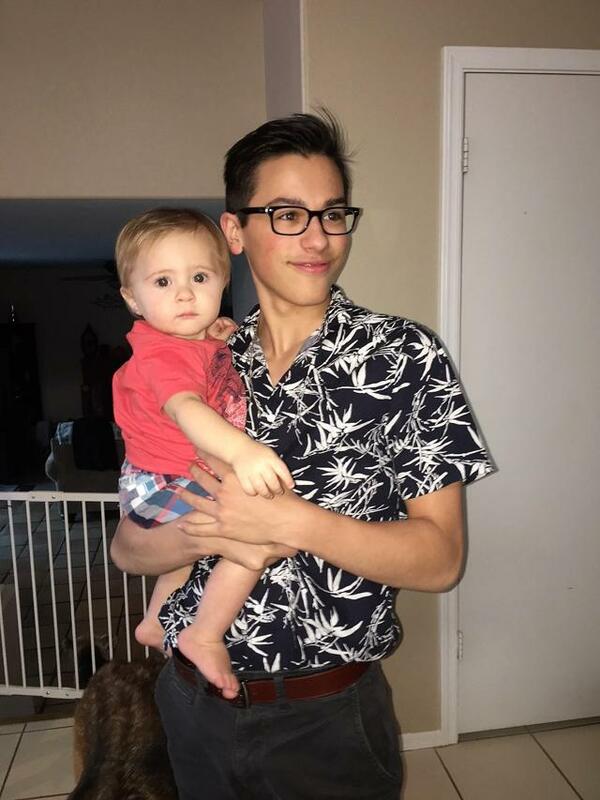 The kid in the black and white tropical vacation shirt will be heading off to basic training to join the Air Force in December. The kid in the red shirt, he started to drink out of cups and uncapped bottles while we were visiting. I am immensely proud of both of them. After visiting for a few days, we grabbed a rental car to drive through the desert over to Las Vegas, where my parents have retired to. On the way out of town we stopped to visit a friend who is being deployed to Cuba for nine months. My Guantanamo (presumably, he doesn’t discuss actual orders) bound friend had us meet him at a restaurant near Luke Air Force base. 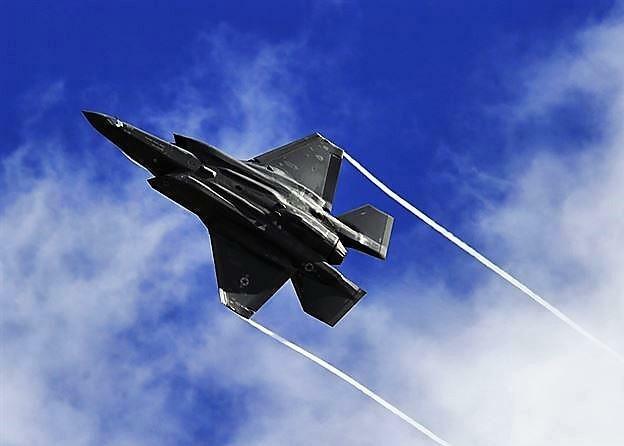 As we were getting off the highway, my nephew and I spotted a pair F-35s in the air getting ready to land. One peeled off and then the other about five seconds later until they circled around. As that happened we saw four more coming in, so we pulled over. We watched a dozen F-35s land. Two of the last four left their flight path a bit and flew directly over our heads a few hundred feet above the deck. I’m guessing they saw us on the side of the road watching and flew over on purpose. Very cool. Very loud. We didn’t take pictures, but this is about how it looked without the trails. On the way to Las Vegas we drove pretty much straight through, except to take some pictures at scenic overpasses near the Hoover Dam. Once in Vegas, it was to the folks house where we then headed off for a very good Mexican dinner to kick off the visit. While there, we played cards, made prime rib and did some sight seeing. Tuesday night, my nephew and I headed down to Fremont Street Experience and saw what you see there: music, a lot of people, some almost naked people and some street art. We were also on a mission to pick up some $1 chips from a few old casinos for my brother to use as insets in a poker table he is building. Mission accomplished. Six $1 chips only cost me $94, but I did also get a beer. My folks took my nephew to High Roller, the giant ferris wheel, on Wednesday, while I played poker at Aria with a friend who happened to be in town at the same time. I took some pride when my friend, who I’ve been mentoring a bit on poker, took down 3rd place in the daily tournament for $1500. I busted out when my Aces were cracked as a 91% favorite. Like investing, even when the odds are strongly on your side, sometimes you still don’t win. after playing the cash game for a few hours, I broke about even, which is a pretty bad bottom line day for me. I did get to talk to an author who was seated next to me who filled me in on the Black Mountain Institute for writers in Vegas and am going to read her book. On Thursday, my nephew and I headed out to see a condo I am considering. I was a bit overwhelmed, but won’t share the location because I might invest in a unit and don’t want to bid it up. After the condo, we headed over to the Bellagio for lunch at an overpriced Italian restaurant (grandma is still better and cheaper) and the Samurai exhibit. We picked up a couple $1 chips at Caesar’s that only cost me $97 – once again I got a beer too. We finished the trip with dinner and breakfast with my folks, as well as, a few games of cribbage. I’m writing while Frontier decides when we’ll actually be flying today. Currently we are on a 1 hour delay. I’ll be flying Southwest in the future to Las Vegas and Phoenix, the extra fees with Frontier make their teaser prices not really that good. He said to me: “Kirk, do things that you want to do in life while you can. Someday you won’t be able to and you’ll regret it. You’ll become bitter.” He said that while on oxygen about 5 months before he died. I’m telling stories today, because when I left, the stock market was at about the same level it is today. So, while I didn’t miss much in the markets, and I was checking to make sure nothing horrible happened, I was able to do some good things in the meantime. Sure, I have work to catch up on now, but being obsessed with anything is a bad idea, even the stock market. Stock market investing is a lot easier than we make it out to be. Trust me when I say to be patient and to not chase the market. I have told you recently to move to 25% to 33% in cash again. I mean that and I am right. We will get opportunities to buy growth and assets on the cheap again soon enough. Maybe that’s what Warren Buffett is thinking, he’s 37% cash at Berkshire Hathaway (BRK.B) right now with $109 Billion! While we wait for great opportunities, and say no to good and mediocre ones, as well as, possibly betting against some bad ones, get out and do somethings with people you love. I didn’t get to spend a lot of time with my nephew while he was growing up because I was busy with my kids and an ex-wife who, well, wasn’t fun to say the least. I’m glad we took this trip and I’ll deal with getting work back to where it belongs. GE Isn’t a Retiree Investment Anymore and Retired Dividend Investors Should Be Scared Now. We’ll see what goes viral and what doesn’t. What I know is that there is a bear market coming in the next several years, maybe two, and we can make a lot of money playing what is coming the right ways. Get it into your mind to kill whatever investing mantras or ideas that you might have if it isn’t to adjust your asset allocation for defense now and to prepare for buying tomorrow’s great assets cheap. Those are the only things you ought to be thinking about, that any enjoying your life and the people around you.